This morning I found a tiny wild strawberry! It was near the roots of my black walnut tree! I noticed a few black walnuts that I wanted to pick up and there it was- so tiny and another little strawberry plant with a bloom! It was like a small miracle- an unexpected present (my birthday is next week) from my own small patch of the world. 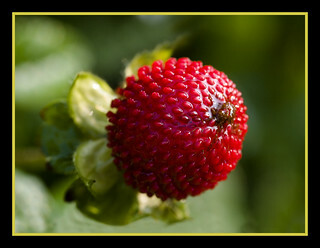 Perhaps I will treat myself to an ice cream dessert tonight, and top it with my own strawberry. I did pick up about 10 black walnuts. Last year I had a bumper crop and plenty to share with friends- I wrote an article about my black walnut cracking adventures ( see my archived articles).